As a truck driver with a flatbed trailer you can haul anything from roof shingles to steel rolls and items that have odd shapes to them. The challenging part as a truck driver is that you have to secure the load properly with straps or chains depending of the weight of the product. You may also need to tarp the trailer before driving. Securing the load is very important and there are basic guide lines to follow. You need a strap for each pallet and two straps on the pallet on the rear of the trailer. This is a minimum to consider the load secure. The weight of the pallet may require the use of chains to secure the load. Your gut feeling may want you to add a strap or two. Always go with your gut feeling.You do not want that load to shift it could cause a roll over or risk loosing your load, or worst yet a life. You need to check your load after the first 150 miles. This is very important. 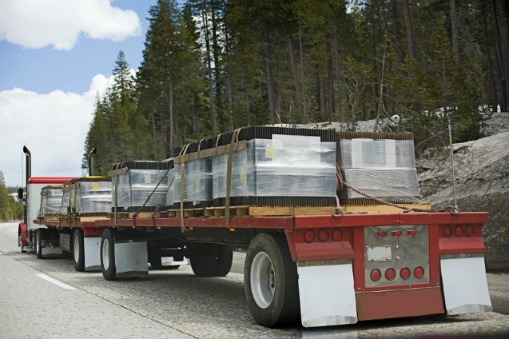 A load can shift after you start moving and the straps or chains can become loose. The cargo securement system used to restrain articles against movement must meet requirements concerning the minimum number of tie downs. This requirement is in addition to complying with rules concerning the minimum working load limit. When an article of cargo is not blocked or positioned to prevent movement in the forward direction, the number of tie downs needed depends on the length and weight of the articles. There must be - one tie down for articles 5 ft or less in length, and 1,100 lbs or less in weight; two tie downs if the article is - 5 ft or less in length and more than 1,100 lbs in weight; or greater than 5 ft but less than 10 ft, regardless of weight. I worked with a friend that really liked working with Maverick trucking company. They are not afraid to hire new drivers. He felt the the company really believed in safety. When safety is integrated from the top all the way down to middle management it makes life as a driver really nice. The areas that made him feel that they believed in safety was. The training he had at the company. The class room instruction. They teach how to secure a load properly and talk about the dangers of loads that are not secure. The working with other employees in his training program had a great attitude about safety. I hope this gave you some ideal on what it would be like to drive a flatbed . There are a lot of things to learn. Many drivers love the work.